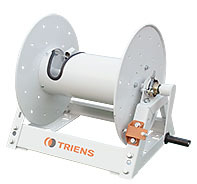 TRIENS America introduces new Hand crank reels. This heavy duty steal hand crank reel holds up to 325ft 1/2" hose. Spraying, Pest control, and more.